The Fairhaven Selectboard an­nounced the implementation of the townwide 25 MPH default speed limit, effective January 1, 2019, at its meeting on Monday, 11/19/18. Both the board and Town Meeting voted to pass the default speed limit. It will be in effect wherever there are no speed limit signs. Instead of drivers relying on the old rules they learned about densely populated areas, etc., to figure out what the limit is on certain roads, the speed limit will be 25 MPH everywhere, unless otherwise posted. “I think it’s a good idea,” said Chief Myers, to have 25 MPH on unposted roads in residential areas. Selectboard member Charles K. Murphy, Sr., has long been a proponent of drivers slowing down. He said 30 MPH is too fast on most roads in town. The department will place signs at the entrances into Fairhaven notifying drivers of the change. Chief Myers stressed that the roads that are already posted will not change. The new limit is for unposted roads only. “I think this is a great idea,” said Selectboard Chairperson Daniel Freitas, noting that West Island residents are especially vocal about finding ways to slow drivers down. The town will notify residents with posts on social media, said the chief. The board appointed Carol Burt to that board. In her letter requesting an appointment, Ms. Burt listed several groups she volunteers for, including the Social Day Program at the COA’s Senior Center. She works at Atria Assisted Living. The board also appointed Eric Dawicki to a spot on the Marine Resources Committee. Tim Keogh, the operator of Bask, the town’s registered medical marijuana dispen­sary (RMD) that has also applied for a recreational retail license, met with the board to briefly discuss the creation of a host community agreement for the retail operation. The RMD has a host agreement with the town, but a separate one will be necessary for retail sales. The agreement will outline regulations that include how much the operation will pay the town in addition to regular business taxes, etc. Town Administrator Mark Rees suggested that the board create a working group with members he will appoint, to work out the details of the agreement with Bask. Mr. Murphy expressed an interest in being in the group because he was on the marijuana advisory committee. The group will be appointed by Mr. Rees, so the board did not vote on the appointment of Mr. Murphy. Mr. Keogh told the board that he did not think it would be “too heave of a lift,” since there is already one host community agreement in place. The Attorney General’s Office has not yet approved the bylaw regulating recreational marijuana sales in Fairhaven that was passed by Town Meeting on 11/13. The town can still go ahead with creating the agreement. No sales will take place, however, until the AG approves the bylaw and all local regulations are approved. The board also lent its support to the annual “Prize-a-Palooza” raffle event at the Seaport in on 12/2. The annual event raises money for the Neediest Families Fund administered by the Salvation Army in New Bedford. Mr. Murphy and Mr. Espindola both promised to be celebrity bartenders. Mr. Freitas promised to try his best to get there to support the cause. According to organizers, the event raised $32,000 last year. The board also reviewed and accepted the preliminary report on their FY20 policy goals and objectives meeting. Mr. Rees will get input from department heads, incorporate it into the report and then resubmit it to the board for a more in depth discussion at a future meeting. Mr. Espindola said it was one of the best things Mr. Rees brought to town. He said it makes it easier to see all the good things going on, and the progress made on each goal. 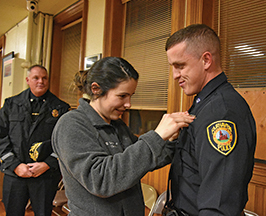 Melissa Carrette pins the badge on her husband Michael after he is sworn in as a Fairhaven Police Officer at the Selectboard meeting on 11/19/18. Photo by Beth David. The board also welcomed Michael Carrette to the Fairhaven Police Depart­ment as patrol officer. 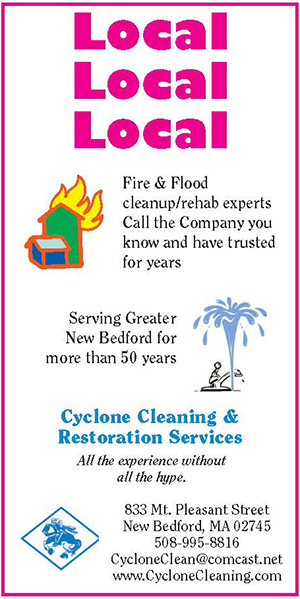 Chief Myers made the appoint­ment, which was approved by Mr. Rees. Chief Myers told the board that he was proud of Mr. Carrette’s per­formance in the academy, noting he won a top award. Acting Town Clerk Caroline Hurley swore in Mr. Carrette, whose wife then pinned a badge on him, although he had been on the job for two days already. But, they had fun doing it. His wife Melissa said she was proud of him. 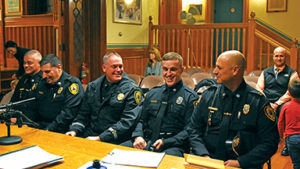 Fairhaven Police Department members share a laugh at the Selectboard meeting on 11/19/18, when Officer Michael Carrette was introduced and sworn in as Fairhaven’s newest full time patrol officer.. L-R: Lt. Kevin Kobza, Sgt. David Sobral, Chief Michaal Myers, Officer Carrette, Capt. Michael Botelho, Det. Sgt. Matt Botelho is seated in the back. Photo by Beth David. Mr. Carrette graduated from the Reading Police Academy on November 14. He earned the top award in class for defensive tactics. A former corrections officer with the Bristol County Sheriff’s Office, Mr. Carrette is also a US Navy veteran, Petty Officer 2nd Class, who deployed for one year to Djibouti, Africa with Coastal Riverine Squadron 8 out of Newport, RI. He was a convoy truck driver transporting patrol boats to various ports throughout the country, and a crewman/ engineer working as a .50 caliber gunner conducting security escorts for inbound vessels. Mr. Carrette holds a BS in Criminal Justice and a minor in Political Sciences from UMassLowell. He lives in Fairhaven with his wife Melissa and their two young children. 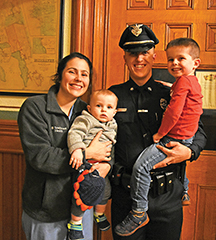 Fairhaven’s newest patrol officer poses with his family after he is sworn in at the Selectboard meeting on 11/19/18. L-R: Melissa and Michael Carrette with their children, Harrison and Samuel. Photo by Beth David.